Believing that there is still so much more to be mined from their stories of precious figurines at play in a heightened fantasy world, new sequels are in the works for both Enchanted and G.I. Joe—which remain separate franchises, for reasons of corporate inefficiency. A third G.I Joe has been moving slowly but surely since last year’s G.I. Joe: Retaliation, and now Variety reports that the search is on for a new director (as Jon M. Chu is busy with both his Jem movie and a Now You See Me sequel) to helm a film where most of the non-Channing Tatum cast is expected to return, for a story that’s expected to focus on Dwayne Johnson’s character Roadblock. Said story is not expected to involve Roadblock stumbling through a magic portal in Times Square and falling for a lawyer, all while trying to reconcile his cartoonish desires to explode everything with a bazooka with the way the real world works. This is because no one knows how to streamline anymore. It’s all, “Let’s make two separate expensive movies!” This is why America is losing to China. Anyway, development of a follow-up to 2007’s Enchanted has been surprisingly unhurried, considering the original was an Oscar-nominated hit right in the Disney princess wheelhouse, and so it seemingly should have spawned at least four straight-to-DVD sequels by now. Regardless, in the wake of Frozen, a script is now being written by guys who already wrote a movie about fantasy characters stumbling into the real world via a magic portal in New York, The Smurfs’ J. David Stem and David N. Weiss, which definitely bodes well for those who thought Enchanted could have used more smacking into things. 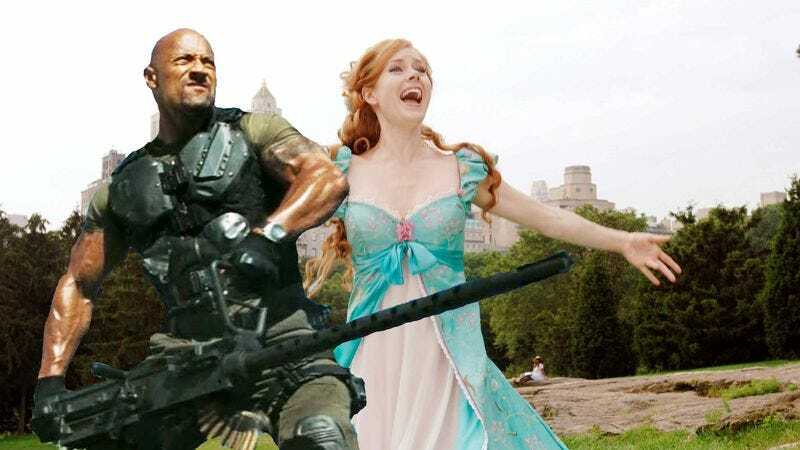 As of now, it’s unclear whether Amy Adams will return for Enchanted 2, or whether Disney and Paramount will take our advice and just bring in Dwayne Johnson. Perhaps they enjoy wasting resources.